There’s an old saying where the grass is always greener-meaning that by comparison on the surface another person’s life seems better than yours. However two primary colors are needed to create green-just as in life individuals were created with imperfections and were not meant to be whole until joining with their symbiotic partner to make them a better person. 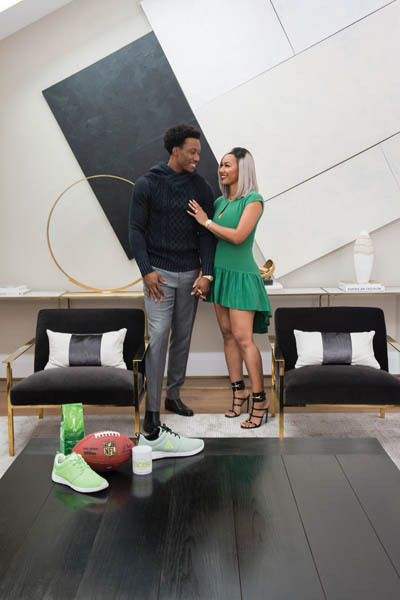 A perfect example of this deep symbiotic connection is the relationship between Michi and Brandon Marshall. 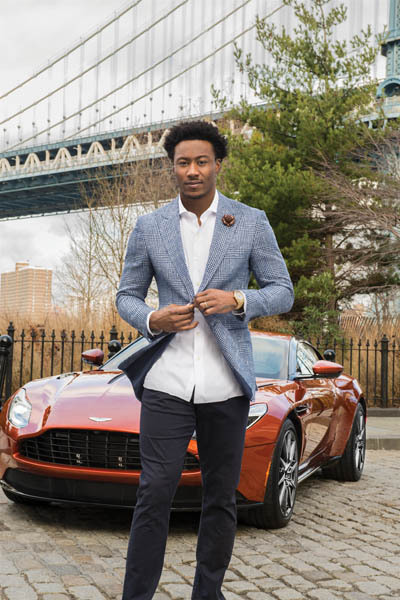 Though they seem to have everything they want in life- the fame, the money, the glory, this picture of perfection was shattered in 2011 when Brandon Marshall was diagnosed with borderline personality disorder. Since seeking treatment his life has changed. With the loving support of his wife and family he has turned his life around. 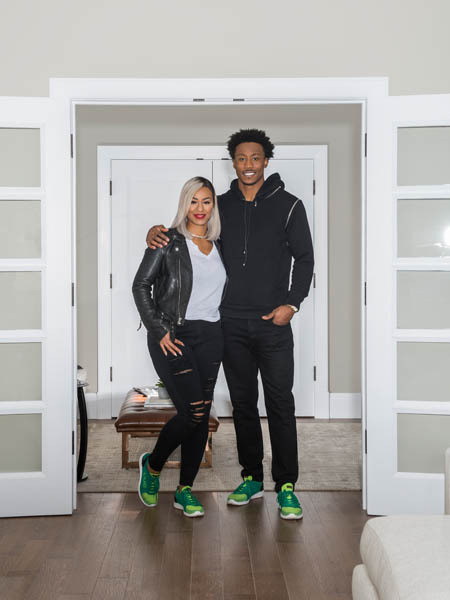 Recognizing the stigma attached to this often undiagnosed disease, the Marshalls are using their celebrity to eradicate the stigma and provide Youth Mental Health First Aid trainings to teachers, clinicians, parents, teacher and more through their non-profit, PROJECT 375. RM: You seem like a very loving couple. How did you meet and what is your secret to making your marriage work? That is a loaded question. We actually met during my junior year of college. I was walking across campus and Brandon saw me with one of his friends, Darcy Johnson, and told him, ‘That girl is going to be my wife.’ A couple of days later, we crossed paths and he said “Hi, nice to meet you. Can I be your friend?” I responded, “Eh no,” because at the time I had a boyfriend and I knew he played football and felt that this was just about my looks. Ever since then whenever I saw him on campus I’d say, “Hi friend.” Even until to this day I say, “I love you, friend.” But the discrepancy with his version is that he always says that I was walking across campus in heels, but I was in flats. BM: On campus, when I was walking to the student union I saw this beautiful and interesting girl in jeans and high heels. I stopped to talk to her and that’s where it started. 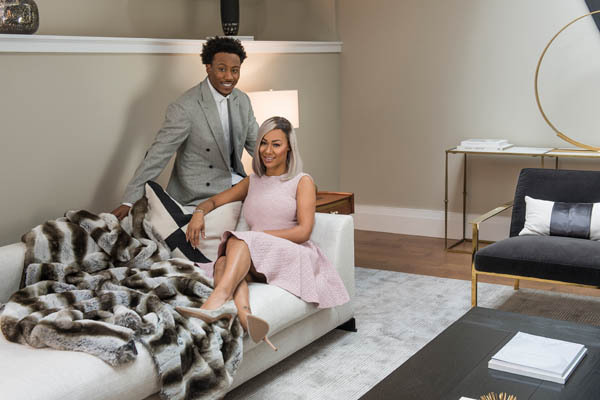 People have to understand that married relationships are no different than a career. The mistake a lot of couples make is that they put a lot of effort into their careers, but not the same effort into their relationships. I think that’s why we see a lot of broken homes and failed relationships. RM: How do you complement each other? MM: I’m super organized to the point where it can drive somebody absolutely insane, but Brandon has a laissez faire attitude with organization. He tends to misplace things, his closet is disheveled but I’m able to help him with those areas. I can find what he’s looking for 99% of the time. Brandon is more outgoing than I am. I am a little bit more of an introvert. He’s able to talk to people and feel the room whereas I like to sit back a little bit and observe. I’m extremely analytical and he’s very strategic. Sometimes it’s a real competition because we think about things in a completely different way, but it’s also fun. It’s a good thing when you can balance each other out in different areas of life. BM: The biggest thing we’ve noticed about each other is that we balance each other out. Michi is really analytical and works at the micro level while I work at the macro level. RM: How did having children change both of your lives? MM: It changed a great deal. You think about things differently. I actually think more now about psychology than I did before having children. I see how the environment we created at home affects them as they are going through different stages in their lives from the people that we bring in to the routines. Brandon has changed his perspective a great deal as well, because in the back of his mind when he’s televised on the field he knows that his children could be watching him, and he wants to be a role model for them. Brandon’s not Brandon Marshall at home. He is daddy to them and friend number one to me, and that’s his skill. He had to learn how to do that. It’s not something people learn overnight. Even when he is away for a game, we Facetime and he is present with his family. When our children grow up they will remember that they were his number one priority at every stage of his career. RM: You lived most of your life without knowing that you had an illness. What was it like when you were diagnosed? BM: Some studies have shown that we have the first break at the ages of 18, 22, or 23. So for me I always felt that I was healthy. But at the time I was diagnosed there were so many things that happened in my life at once. I was dealing with my career and relationships that changed me from a healthy person to one with borderline personality disorder. When you don’t deal with it, it’s undetected and the problem gets worse. That’s when I found myself at McLean Hospital where I did a clinical evaluation to see if I was even capable of change. Through this neurological test I found out, luckily, that I was capable of change, because some people are not because of the way their brain is blocked. During the three months in an out-patient program I learned a lot about how my brain works and how it processes things. MM: Any mental health issue is challenging, but Brandon’s was very challenging because he was unaware of his illness. Once he was diagnosed he was able to understand and accept what he was dealing with, how to cope with it, and determine which skills he needed to learn. Being able to understand those things was like night and day. He was more present, more mindful, and was able to recognize some of the situations that might be upsetting and trigger an onset. He was able to reflect on it and bring himself back to baseline more quickly than before. If you’re unaware that something is happening, you can’t really stop it. RM: Give us an example on how your brain works vs. somebody else’s brain. BM: I don’t do well with grey situations. I only think in black and white, that’s one of the criteria of being diagnosed with borderline personality disorder. So, I had to go through Mentalization therapy, which is a group therapy to learn how to live in the grey and process things. Now, when I find myself thinking in black and white I automatically use the skills and tools that I learned in rehabilitation to be able to navigate through whatever I’m going through. RM: How does your diagnosis affect you on the field? BM: With football there comes a point where you figure out who you are and what your strengths and weaknesses are. One of my weaknesses is being in a toxic and exhausting environment, which is what football is, it’s like walking into a trap every day. It’s challenging but I know how to manage and deal with it. RM: Whose idea was it to establish PROJECT 375? MM: It was actually both of ours. I have a background in psychology and I worked in the health field right after college. This is an area that I’ve been involved in for a very long time. My mother has her PhD in clinical psychology. I grew up understanding how important the psychology of the mind is and when Brandon was diagnosed with borderline personality disorder due to some incidences in his career, he went to McLean Hospital. We were trying to figure out where he needed the most help and what could benefit him the most. The pain that he was in could not necessarily have been avoided but the blow could have been a little less if it was detected sooner. And we decided very early on that we wanted to help people who may not have the resources or understand how important psychology is. This is not something to be ashamed of, not something to hide, nor something that stigmatizes, and we wanted to put a face to it and humanize mental health. We know the narrative of mental health is a little rough when we talk about it but we want to let people know that they’re not alone. One in four people have a mental health issue. But this also affects all of the loved ones around that person- it affects everyone. RM: What are some of PROJECT 375’s recent initiatives? MM: A wife of Brandon’s friend asked him to come to speak to some kids. She works with kids with behavioural issues in school. And I remember when he came home he was in tears, because some of the kids he spoke with were 9 and 10 years old contemplating suicide and dealing with bullying and heavy issues. We decided we were going to focus on children. And that’s how our project evolved and became what it is. We really want to make the most impact on the lives of children to be proactive instead of being reactive. BM: When we first started our work, the narratives were very different and significantly more negative. The conversation wasn’t where it needed to be, and within five years it’s become an everyday topic now. We want a place to put faces to it and we want to be one of the faces to break down the stigma. That’s a big accomplishment not only for PROJECT 375 but also for the mental health community. We feel that our team has done an amazing job of making sure that we’re at the forefront of that conversation. RM: Who are you rooting for to go to the Superbowl? BM: Nobody. It’s tough because, I’m a player so I’m not rooting for any teams. Since I’m from Pittsburgh which has a culture of being football crazy and everything is about the Steelers. A win by the Steelers can really boost the city and community so if I don’t have a chance to play in the playoffs in the Super bowl, I am always rooting for the Steelers and Pittsburgh. RM: What do you like to do as a family? MM: We love playing games and watching movies, Brandon’s favorite movie is Life with Martin Lawrence and Eddie Murphy. He likes comedies but I like horror movies and mystery which fascinate me because of my background in psychology. Silence of the Lambs is the ultimate movie for me. We also like competitive games such as bowling. He plays chess, all the time, but since I don’t understand chess, I won’t play with him. I play a crime scene game where you find clues and the suspect. Along with psychology, crime scene investigation, profiling and criminal profiling, I like to play the forensic psychologist. RM: What are your favorite foods? MM: Sushi. Nobu in New York is one of our favourite restaurants. Our favourite foods? Mine are chicken wings and French fries. And his will probably be the same or spaghetti. RM: Do you prefer living in Brooklyn or Miami? motivation, the fashion, the people, the culture you see here, there’s really no comparison. But Miami has the weather. BM: The thing that we love about Brooklyn is that we have space down here, New York is everything. That’s who we are. We’re that kind of people- we’re blue collar, we’re tough, and we think that New York City exemplifies all of those things and much more. We love it, there are so many different people and the culture is amazing. You walk down the street and you can see four or five different ethnicities, which is awesome, especially for our children. RM: What do you want to do when you retire? BM: I’m already doing it. I am on a show on Showtime, and also growing PROJECT 375 and actively bridging the gap in the mental health community. MM: Whether it’s television or film I’m excited to watch my partner evolve. We love New York and New York has been so good to us, so hopefully we will get to stay here. And I’m hoping to start a new career as well in television.